From the dusty landscapes of Australia’s red centre to the bushlands and billabongs of the north, this part of the country is full of surprises at each turn. Uncover relics of the past at ancient indigenous sites such as Mawurndaddja, hike through the ochre clefts of Kings Canyon and splash in the watering holes of Kakadu. 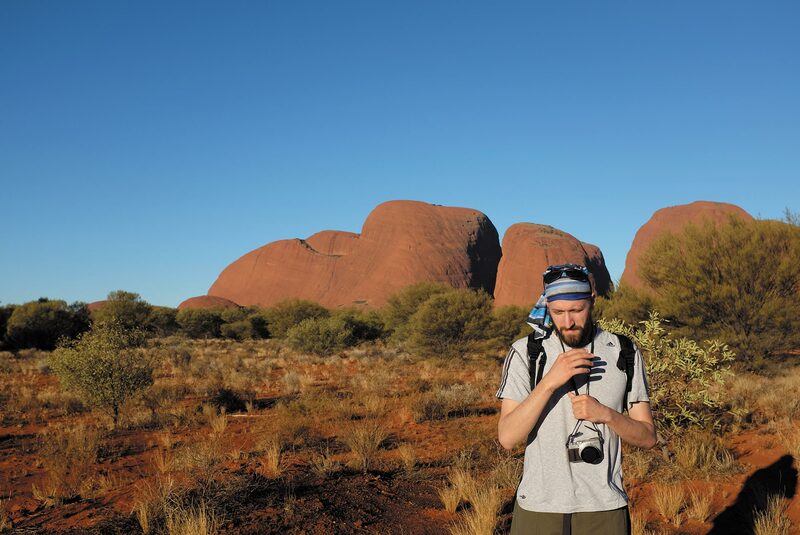 This afternoon, make your way to Kata Tjuta (the Olgas) and take a guided walk through the awe-inspiring Domes of Kata Tjuta. We then head to Australia's most iconic landmark - Uluru (Ayres Rock). As the sun begins to set below the horizon, take a glass of sparkling wine and watch the rock's rich colours change against the backdrop of a blazing Red Centre sunset. The perfect end to a remarkable day is awaiting you back at camp, as you enjoy a famous 1,000 star dinner. With the red earth at your feet and an infinite sprawl of stars overhead, sit down to a candlelit spread of locally sourced food and wines. Notes: Total driving time is approximately one hour. Total walking time is around an hour. An early start this morning is rewarded with an Uluru sunrise. While the morning is fresh enjoy a walk around the base of the rock. After your stroll, we walk to the cave paintings near Mutitjulu Waterhole at the base of Uluru. You will be in the hands of an Anangu guide who will share the stories of this unique landscape and explain the Art, the Culture and connection to Land. It's also a unique opportunity to share experiences, and to connect with and learn about the oldest culture on Earth. Once you’ve had lunch, perhaps purchase some indigenous art and craft at the Uluru Cultural Centre. Travel onto the exclusive campsite within Watarrka National Park (Kings Canyon), where the group will eat and sleep for the night. 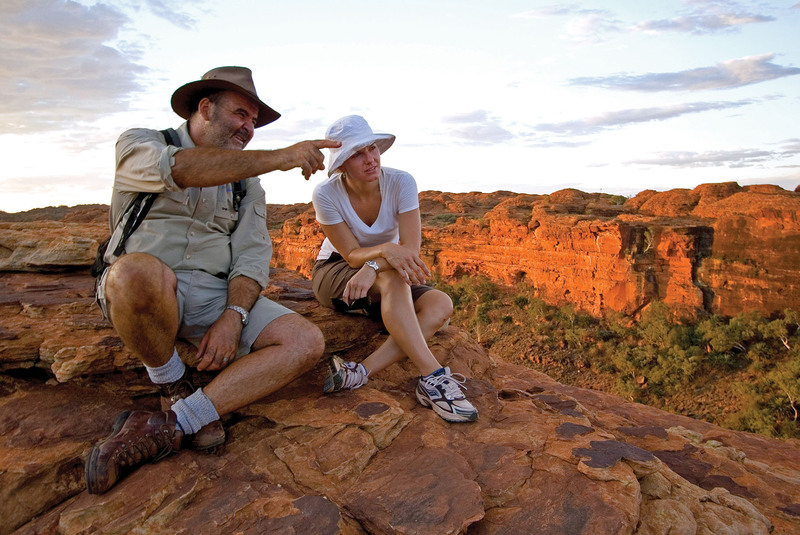 After breakfast, get your hiking shoes on and head out to explore the impressive formations of Kings Canyon. You’ll be left breathless by the sheer beauty of the canyon, as you trek through the Amphitheatre, the Lost City, the lush and ancient Garden of Eden and the North and South Walls. Lunch is a welcome prospect, before you make your way back to Alice Springs where you will stay for the evening before catching a flight to Darwin tomorrow. Note: Total driving time takes around five hours. Total walking time is approximately three hours. Today, skip the 1,500km of driving which is about 24 hours by road, and fly from Alice Springs to Darwin with Qantas Airways. Qantas was Australia's first commercial airline, and stands for "Queensland and Northern Territory Ariel Services" and is now one of the worlds best International airlines. We'll arrange your air tickets and issue them a couple of weeks prior to your departure. On arrival in Darwin, someone will be waiting to transfer you to your hotel. Welcome to Darwin, capital of Australia’s Northern Territory. After meeting with your group, depart en route to explore Litchfield National Park to get a proper glimpse into the rugged landscapes of the Top End. Visit Florence falls, Buely Rock Hole, Wangi Falls and the Termite Mounds before departing in the afternoon to the Mary River campsite. From watery gorges to dry, monolithic termite mounds, Litchfield’s landscapes are astounding. The region is characterised by rich reddish-brown soil and cliff faces, which create a contrast next to the rough green leaves of the gumtrees above. Swimming under the cascading waterfalls and relaxing in waterholes is a favourite pastime for visitors and locals alike – they’re a fantastic place to hide away from the heat. Next stop, head to the border of Kakadu and Arnhem Land to experience a cruise through Guluyumbi along the East Alligator River. 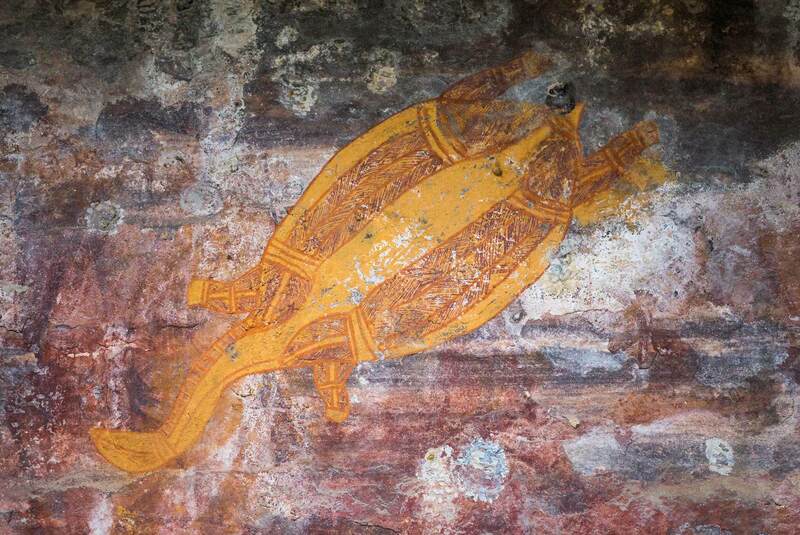 Travelling with a Binninj guide, understand more about the cultural importance of the East Alligator River to the region’s traditional custodians while hearing tales of the dreamtime – the religious-cultural concept crucial to the Aboriginal understanding of the world. Once the cruise wraps up, jump in a vehicle and cross straight into Arnhem Land for an unforgettable afternoon of exploration. Begin at the Injalak Arts Centre to discover incredible examples of indigenous art, witnessing traditional paintings, bark art, basket weaving and screen-printing being created during a walk with an Indigenous guide – the option to purchase a piece to take home with you is also available once the walk comes to a close. After visiting the arts centre, unveil more indigenous art at two exclusive sites. The first site, Mawurndaddja, is a spectacular series of galleries with art thought to be over 18,000 year old – your guide will explain the importance of this art and the methods used to perform this expressionism as you wander through the site. Keep an eye peeled to find ochre and ancient spear tips lying on the ground, offering a glimpse into the history of an age long past. Spend the afternoon exploring this historic site, breaking time up with a few snacks and drinks along the way. Following this, head to Kakadu for an overnight stay. 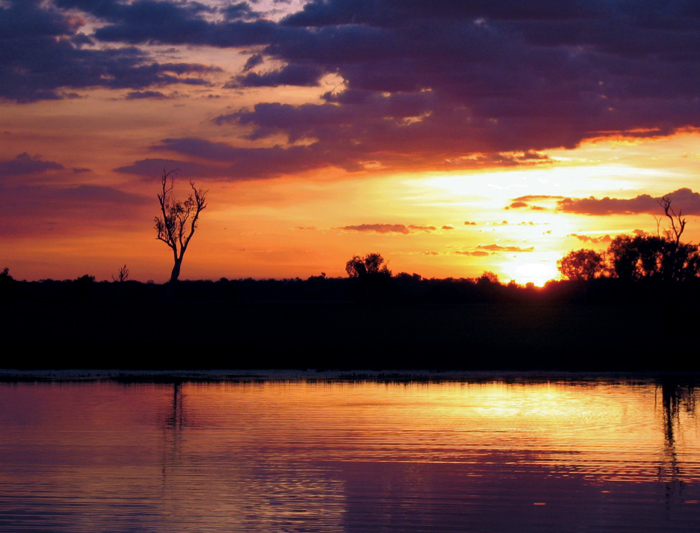 Take a cruise down the famous Yellow Water Billabong, one of Kakadu’s best-known natural attractions thanks to its abundant wildlife and transforming landscapes. These lush wetlands are patterned with tiny water lilies, contrasted by semi-submerged trees that rise from the water with a determined stoicism. Try to listen out for warbling magpies, spot soaring eagles or do a double take as you spy floating driftwood to see if it’s a crocodile while floating along the lazy waters. Afterwards, head towards Maguk (Barramundi Falls) or Gunlom to enjoy one last splash in Kakadu’s enchanting swimming holes, then return to Darwin where this North Australian adventure comes to a finish.